Has anyone completed this update? Has your MIL started blinking? What software update? For which 'computer'? There are all kinds of updates covering everything from the ECU to the UVO system (though the latter wouldn't have anything to do with a MIL). Probably talking about the "Product Improvement Campaign" letter I got in the mail a couple days ago. 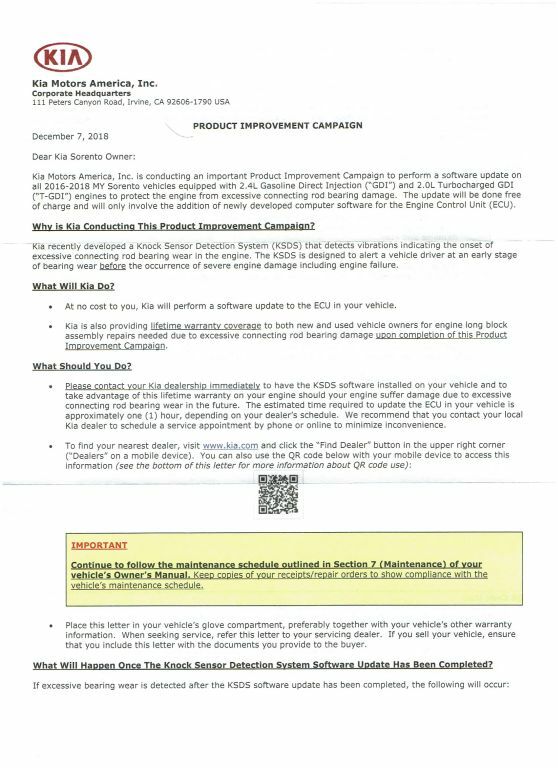 "Kia Motors America, Inc. is conducting an important Product Improvement Campaign to perform a software update on all 2016-2018 MY Sorento vehicles equipped with 2.4L GDI and 2.0L Turbocharged GDI engines to protect the engine from excessive connecting rod bearing damage. The update will be done free of charge and will only involve the addition of newly developed computer software for the ECU." I get mine done next week. I might be stupid, but I don't see how a software flash is going to help a bearing problem. If there is trash in the engine causing excessive wear and failure, you can reprogram all you want but it's not going to flush the casting debris out of the way. hand-filer and MikeB39A like this. It's adding a knock sensor. Here is the letter I got. BrianC302 and MikeB39A like this. It looks like they're reprogramming the knock sensor to detect rod knock also with the expectation that they can catch it before things go thermonuclear. Last edited by hand-filer; 12-22-2018 at 08:21 PM. I got mine done last week. It is an ecu update to detect rod bearing knock and will put the car into limp mode if detected and turn on your check engine light. They have also extended the warranty for life on the long block. I had my update completed 3 days ago. Today the engine light came on and the vehicle went into limp mode. 2017 with 30,000 miles and it has been running perfectly prior to the software update. Dealer is closed today, Sunday. Tomorrow is Christmas Eve, and I’m supposed to drive my son to College next week, 1000+ miles one way. I’m leasing this vehicle and I have had the oil changed every 5,000 miles. I’m hoping the problem is with the software update. I also hope they can diagnose the problem without tearing into the engine. Sorry to hear about your troubles with the update. I was very leery that something like this would happen. I am going to wait and see if this problem continues. I also take meticulous care of my vehicle I have the 2.0 turbo and change the oil every 3000 miles with factory filter and Pennzoil fullsynthetic. Let’s hope they get this issue corrected soon. 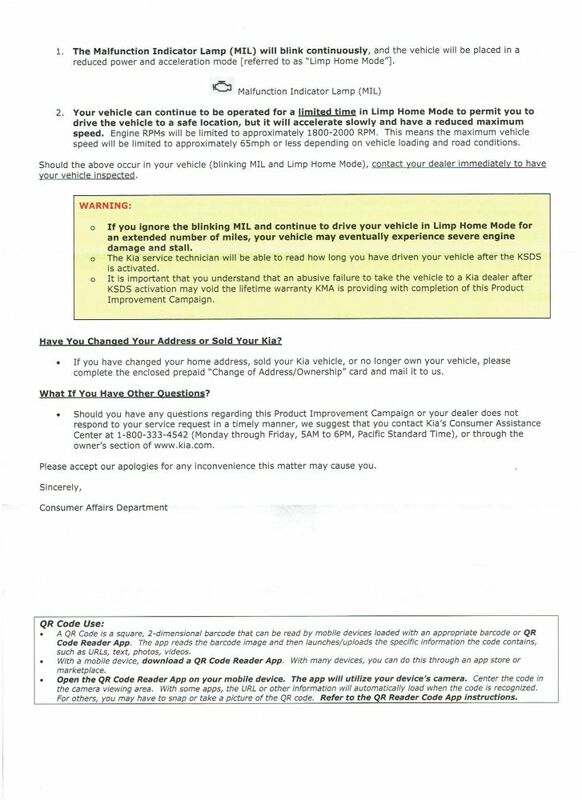 Please leave some feedback as to what the dealer says regarding the update and your vehicle. Thanks.